Agrifood scholars commonly adopt “a matter of fact way of speaking” to talk about the extent of neoliberal rollout in the food sector and the viability of “alternatives” to capitalist food initiatives. Over the past few decades this matter of fact stance has resulted in heated debate in agrifood scholarship on two distinct battlegrounds namely, the corporate food regime and the alternative food regime. In this paper I identify some of the limitations of speaking in a matter of fact way and of focusing on capitalist and neoliberal economies as the yardstick by which to assess all food economy initiatives. Using stories of bananas in Australia and the Philippines I advocate for a new mode of critical inquiry in food scholarship that focuses on matters of concern. Following Bruno Latour I use the term critical inquiry to refer to research methods and thinking practices that multiply possible ways of being and acting in the world. The new mode of critical inquiry I propose centers on enacting three broad research matters of concern. These are (1) gathering and assembling economic diversity (2) human actancy and (3) nonhuman actancy. I argue that through becoming critical minds in the Latourian sense researchers can play a key role in enacting economic food futures in the Anthropocene. I would like to acknowledge the invaluable theoretical work of the Community Economies Collective that underpins this paper. Special thanks to Sarah Yallop, Gerda Roelvink, and Katherine Gibson for feedback on earlier drafts. Thanks also to the journal reviewers for their positive feedback and to Bob Fagan for the inspiration to follow bananas. Alter Trade. 2013. Vision and mission. http://www.altertrade.com.ph/index.php/corp-pro. Accessed 10 Aug 2013. Anderson, B. 2012. Banana farmers still standing after Yasi. http://www.abc.net.au/news/2012-02-02/banana-farmers-yasi-one-year-on/3805212. Accessed 19 Sep 2012. Australian Government Department of Agriculture, Fisheries and Forestry (DAFF). 2011. Fact sheet—Biosecurity policy determination for bananas. http://www.daff.gov.au/ba/ira/final-plant/banana-philippines/biosecurity_policy_determination_for_bananas. Accessed 12 June 2013. Cameron, J., and J. Gerrard. 2008. 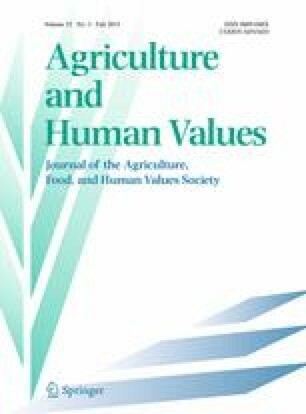 Thinking and practicing values: Community enterprises in the food sector. http://www.communityeconomies.org/site/assets/media/oldwebsitepdfs/Papers/Oncommunityeconomies/ThinkingandPracticingValues.pdf. Accessed 20 Sep 2012. Cameron, J., and R. Gordon. 2010. Building sustainable and ethical food futures through economic diversity: options for a mid-sized city. http://www.communityeconomies.org/site/assets/media/Jenny_Cameron/Diverse_Food_Economies_For_Dist.pdf. Accessed 20 Mar 2011. Follow The Things. 2013. Follow the things. http://www.followthethings.com. Accessed 13 Aug 2013. Gibson, K., A. Hill, P. Maclay, and M. Villalba. 2009. Building social enterprises in the Philippines: Strategies for local development. http://www.communityeconomies.org/Stories#philippines. Accessed 18 Jan 2012. Gibson, K., and A. Hill. 2010. Community partnering for local development. http://www.communitypartnering.info. Accessed 18 Jan 2012. Knowledge @ Australian School of Business. 2011. The price of trade protectionism: Yes, we have no bananas! http://knowledge.asb.unsw.edu.au/article.cfm?articleid=1446. Accessed 20 Sep 2012. Koutsoukis, J. 2006. No bananas for nine months. http://www.theage.com.au/news/national/no-bananas-for-nine-months/2006/03/25/. Accessed 20 Sep 2012. Ombion, K. 2007. Alter trade corporation: From farm workers’ cooperative to profit-seeking company? http://www.bulatlat.com/news/7-1/7-1-trade.htm. Accessed 20 Sep.
YouTube. 2010. Banana splits. http://www.youtube.com/watch?v=2uxlmFrDL5I. Accessed 29 Sep 2012.